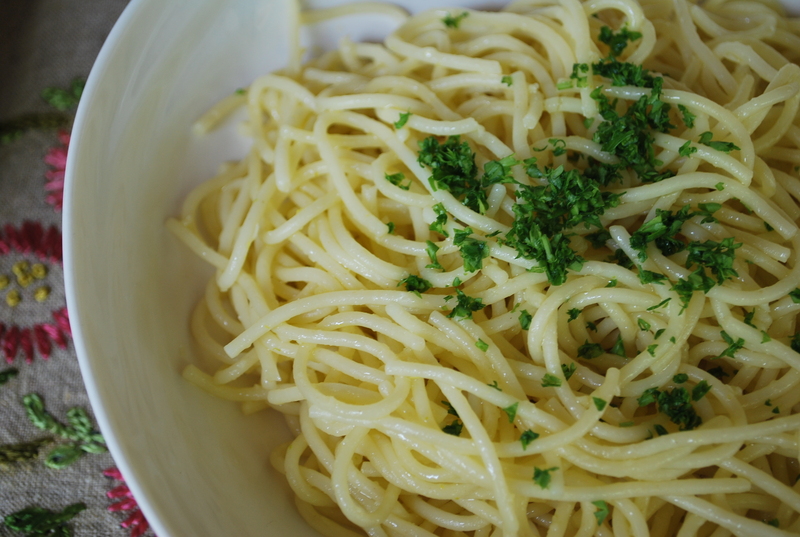 It’s astounding that I’ve had this blog for over a year now and I’ve never posted aglio olio. This is a mainstay in our household, especially when we’re tired or the cupboard is bare. This past week we had a family emergency to deal with so by last night the cupboard was really bare. And I mean really bare. So Andrew whipped up a batch of this simple, elegant, tasty, elemental dish and we left the table feeling satisfied and nourished both physically and emotionally. You could pick up the recipe almost anywhere but the fact that Andrew was trained in the fine art of aglio olio preparation while living in Tuscany just makes it feel that much more authentic. Cook spaghetti or spaghettini according to instructions. When done, drain and set aside, reserving some of the pasta water (Andrew says from the bottom of the pot, not the top of the pot!). Meanwhile, heat olive oil in the bottom of a heavy saucepan. Saute garlic until just tender and aromatic, but not too much. Add a little of the pasta water to make a simple sugo (sauce). Add pasta and toss. Season with salt and pepper to taste. *By buds I mean the full 7 or 8 cloves you find in a bud. It’s not called aglio olio for nothing.